Thanks to a generous grant made possible by The Jefferson Trust, an initiative of the UVA Alumni Association, Rare Book School invites students at the University of Virginia to apply for a fellowship designed to enhance UVA student research employing special collections, including written, printed, and born-digital materials. The RBS-UVA Fellowship Program provides UVA undergraduate and graduate students with scholarships to attend RBS’s celebrated courses on the history of books and printing—classes that are not available through UVA course offerings. The program introduces fellows and their faculty sponsors to visiting peers and professionals in a dynamic environment that fosters hands-on collaborative research and interdisciplinary learning. The RBS-UVA Fellowship Program not only provides fellows with new tools and methods for engaging with primary source materials, it also publishes the scholarship of its participants (via the RBS website), thereby providing other students with aspirational models of scholarly work and intellectual achievement. A brochure for the RBS-UVA Fellowship Program is available for download here. Fellows attend a course at RBS for free (tuition is currently $1,395 or $1,495, depending on the course) and receive a $250 stipend. In addition, the program will award a $500 prize to the most distinguished project from each cohort. 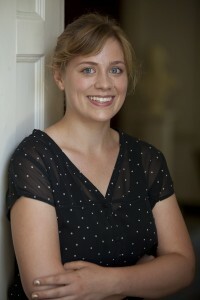 Emma Whittington, recipient of the 2011–12 RBS-UVA Fellowship Project Award, at the 2012 Fellowship Luncheon. Read Emma’s testimonial about the Fellowship. Candidates apply to the program during the spring semester. To be eligible for the program, candidates must gain admission to an RBS course, and they must be enrolled at UVA through the spring of the following academic year (e.g., a third-year UVA undergraduate applying in spring 2019 would attend a course at RBS in the summer of 2019, complete a project during the semesters spanning fall 2019 and spring 2020, and submit a final project in April 2020). Students cannot apply to the program during the same academic year in which they are graduating. Accepted applicants will attend a week-long RBS course in 2019, and will submit a final project to RBS for online publication by 13 April 2020.